A reanalysis of a heavily damaged fossil found nearly 150 years ago has revealed the existence of an absolute monster of the ancient seas. And the discovery of the new species, nicknamed the “Melksham Monster,” shows that an extinct group of ancient reptiles appeared on Earth millions of years earlier than previously thought. 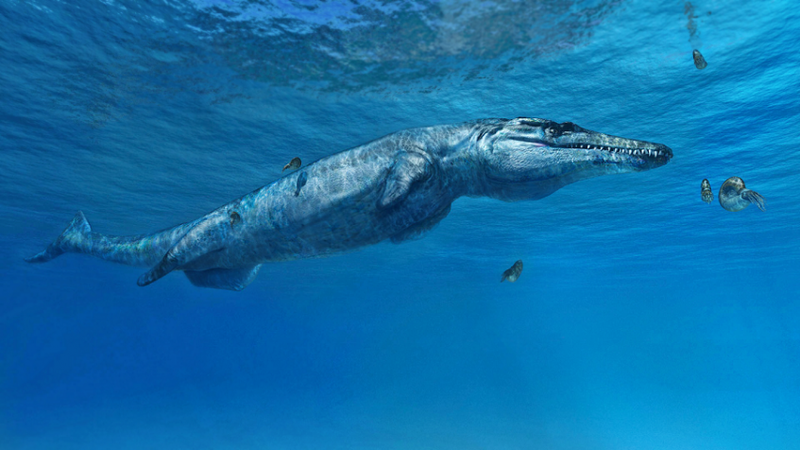 Meet Leldraan melkshamensis, a 10-foot-long marine crocodile that lived 163 million years ago during the Middle Jurassic era. Not only is it a new species of ancient crocodile, it represents an entirely new genus of extinct reptiles. Prior to this discovery, scientists thought that the sub-family of prehistoric crocodiles to which this creature belonged, Geosaurini, emerged around 152 million years ago. But a reanalysis of this fossil shows that this group arose millions of years earlier, during the Middle Jurassic. Modern crocodiles aren’t directly descended from these beasts, but they do share a common ancestor. The new species, as described in the Journal of Systematic Palaeontology, featured long, powerful jaws and large serrated teeth which it likely used to chomp down on various prey, including prehistoric squid. Leldraan melkshamensis, which prowled the warm, shallow seas of what is now Europe, would have been one of the top aquatic predators of Jurassic Britain. Its nickname, the “Melksham Monster,” comes from the English town in which it was found. These findings were derived from a badly damaged fossil that was discovered back in 1875 in England’s Oxford Clay Formation. A research team led by Davide Foffa, a PhD student at the University of Edinburgh, was able to identify the new species by analyzing its skull, lower jaw, and teeth. Indeed, pulling the specimen from the rock was an ordeal unto itself. The fossil was completely enveloped in a super-hard rock, with veins of calcite running through it. The preparation team, led by Mark Graham from the NHM, had to remove these minerals by force using carbon steel tipped chisels and grinding wheels equipped with industrial-grade diamonds. It took many hours and weeks, and considerable care had to be taken to avoid damaging the bits of exposed fossil. “This was one tough old croc in life and death!” said Graham.